Native American students and school administrators march down the South Oval toward Bizzell Memorial Library Monday morning to mark the first Indigenous Peoples' Day at the University of Oklahoma. 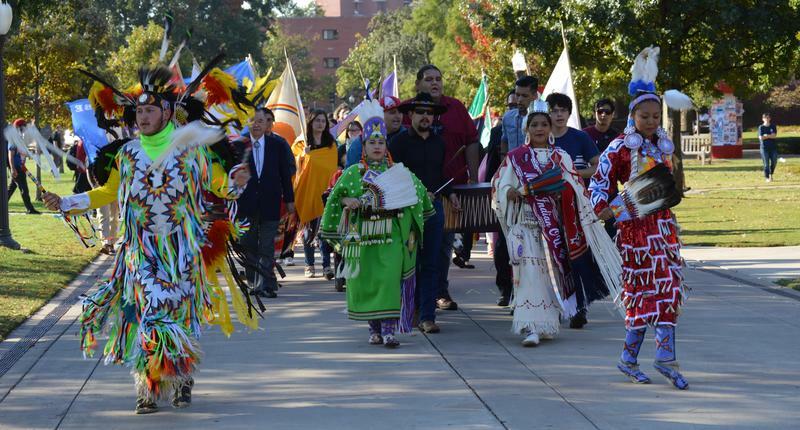 Late last month, after extended discussion, the University of Oklahoma Student Congress officially recognized Indigenous Peoples' Day in place of Columbus Day on campus. The vote was a victory for its sponsors, Indigenize OU, a group of four Native American student activists. The leader of the group is Masters student Ashley McCray. She's an enrolled member of the Absentee Shawnee Tribe of Oklahoma and also comes from the Lakota nations of Oglala and Sicangu. McCray believes that although Columbus Day isn’t a recognized holiday on the University of Oklahoma campus, the fact that it exists at all is disrespectful to Native populations. “Changing it to Indigenous Peoples' Day, is a little step but it's a first step to opening up the doors for communication between the native community and the rest of the student body,” McCray said. Indigenous Peoples' Day isn’t the only cause they are pursuing. They’ve also been protesting the use of the word Sooner on campus. McCray remembers growing up in Shawnee, Oklahoma where her school often glorified the 1889 Land Run. Some students snuck in early and were called “Sooners” a name that gained a more and more negative connotation for Ashley as she learned more about the history of her people. After high school McCray pursued a degree in History of Science and Technology and over the intervening years learned much more about the Native side of the history of Oklahoma. She learned about the hardships faced by her own Absentee Shawnee tribe, as well as many others like the Cherokee, Choctaw, Chickasaw. Oklahoma Historical Society Executive Director Bob Blackburn believes that the meaning behind the name Sooner has changed over the years and although he recognizes the negative connotations the word carries, he sees it as an important element of the history of Oklahoma. Although some Native students disagree about the benefits of continuing to use the word Sooner, there is a common theme, the idea that these conversations need to take place. McCray hopes that an increase in communication and understanding will help everyone move forward. She hopes that in the future more white students will take a lead in educating people about the traumas faced by Native Americans and maybe even help fight for Native causes. “If we're saying that we don't like the word Sooners, even if it does upset you, you need to wonder, "Why are they saying that they don't like that word?" "Why is it affecting them in that way?" McCray said. Bob Blackburn also wants to educate people on the history of Oklahoma Native Americans, but he thinks that using the word Sooner, is a good jumping off point. 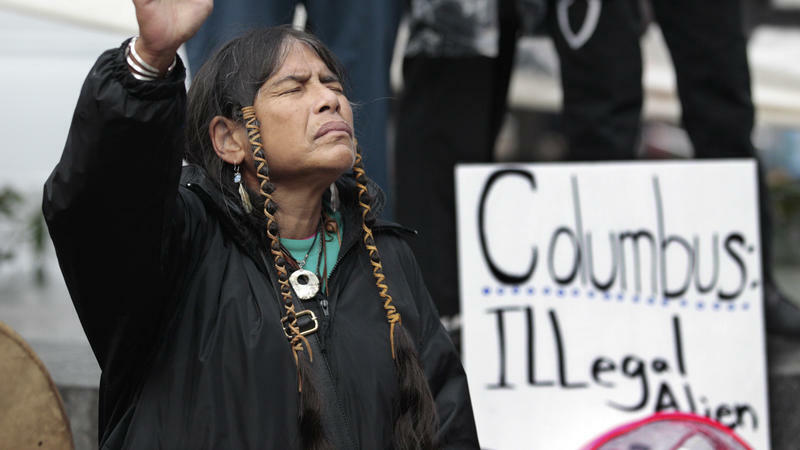 Minneapolis has designated the second Monday of October, the federal Columbus Day holiday, as Indigenous Peoples Day. The city council adopted the plan after hearing concerns that hailing Christopher Columbus as the discoverer of America is inaccurate and ignores the history of indigenous people. Last week, Indigenous Peoples Day supporter and Lakota activist Bill Means told Minnesota Public Radio that the story that Columbus discovered America was "one of the first lies we're told in public education." He expanded on that idea Friday. 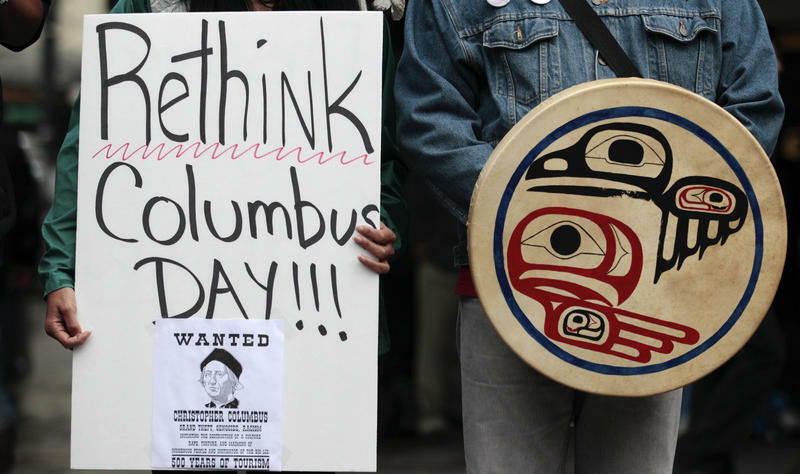 This year's Columbus Day holiday will have a slightly different, more Native flavor in the city of Seattle. Thanks to a unanimous vote this summer by the city council, the federal holiday will now be known by a different name: Indigenous Peoples' Day.